Imagine the scene, it is the British Pie Awards 2013. The judges are scoring pies in the Best Pub Pie category. Imagine the fantastic pies available in the nation's pubs and what a sight it must be to get them all together. No doubt it would be awe inspiring. Now imagine the pie that won, it must be from some gourmet pub chain and look fantastic. You would be right on one count it does look fantastic, just look at the picture below. 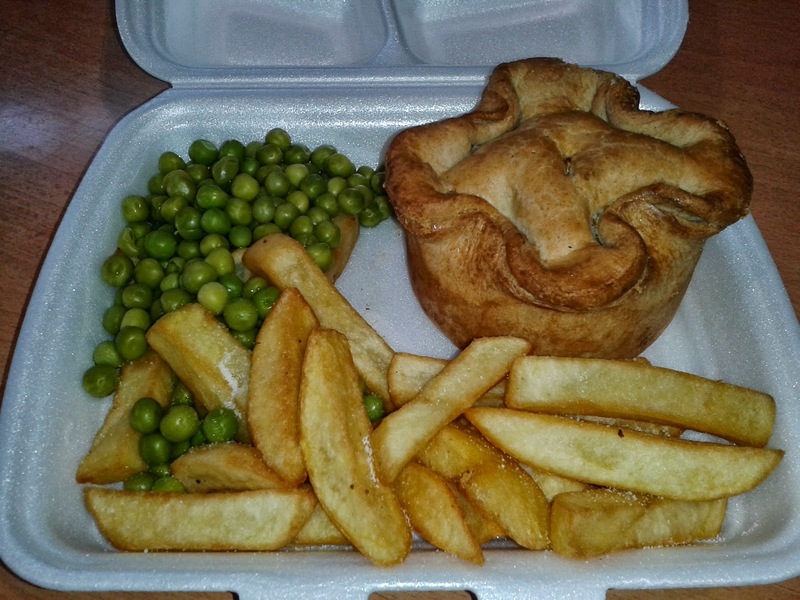 However, you might be surprised to find that this pie is actually served up in Welcome Break service stations! Service stations are not renown for award winning food so how did Welcome Break come up with something that scoops the top prize? Part of the secret, if you look at the list of BPA 2013 winners, is that this pie is made by Dunkleys, perennial achievers at the British Pie Awards, walking away with no less than six awards this year! However, because they make their pies for other people you may not be familiar with them. Upon a recent trip to South Mimms Welcome Break off the M25 I was delighted to have the chance to get acquainted with Dunkleys. Unfortunately they would not let me buy the pie by itself so I had to get a meal at £7.50. Delving into the pie I could see why it is a premium product. It didn't just look good on the outside, but the inside exploded with an appealing content. It was well filled and the height meant it had a good capacity. The meat was tender, there was plenty of mushroom and the ham added a nice flavour. The chicken was in nice big, satisfying chunks. It was flavoursome although, I would have liked it to have packed a bit more of a punch. It was slightly let down by some very thick pieces of pastry, especially with the crinkled pattern on top, leaving it dry in places. 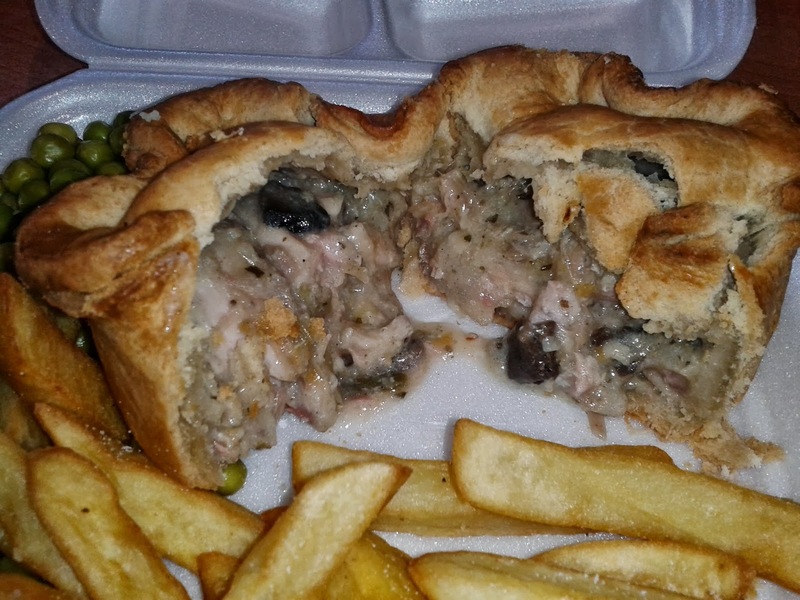 Overall though, this was a pie which I enjoyed eating. However, when you look at the £7.50 cost of the meal and what I actually got I don't think it is one which I would recommend for purchase. Perhaps it was because I ordered to take away but my portion of chips looked quite meagre for the money. I can count about 16 at best. The peas were pretty awful, they look like something served at a school canteen and completely out of place next to an up-market pie. At least Welcome Break had their pie-orities right with this meal but it almost seems pointless to have such a good pie without the rest of the meal to go with it. I was left feeling like this was not a very good value meal despite the pie being well above average. 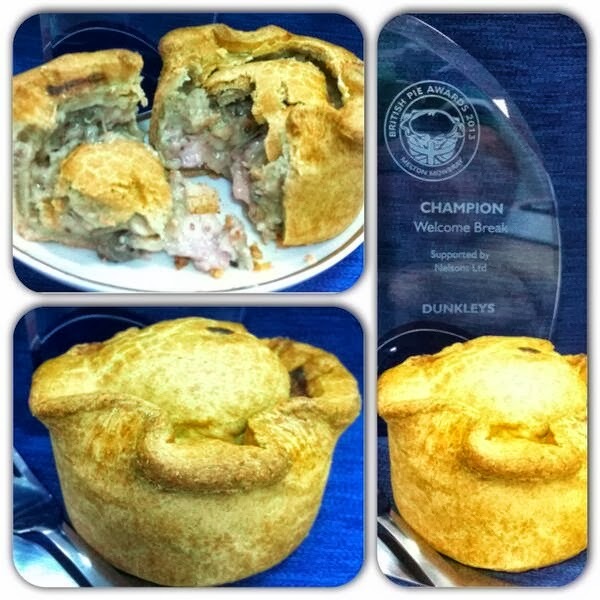 So despite this pie claiming a top prize at the British Pie Awards it doesn't challenge the top of our pie rankings. But then at the British Pie Awards they don't take the cost of the pies into account. This only goes to show that there is one place you can rely on to tell you which pies to spend your hard earned cash on! Keep your eyes on the pies with pierate.co.uk, we try the pie before you buy! P.S. How can this count as a pub pie??? It was a cafeteria!